Yesterday was another of those days in my wonderful life just now, that was full of joy. For some, my day may have seemed very ordinary but for me it was truly magicaaaaaaaaaaaaaaaal. I managed to get out quite early for a refreshing, if a little damp, walk, with my elderly Dad & our doggy, along the river Itchen. My dear old Dad looks forward to his morning walk almost as much as our dog. His knees are quite bad & often painfully lock up on him so he is determined to keep going while he can, bless him. He likes to feed the birds, with leftover pieces of bread. He was followed along the river bank by a flock of crows as well as some enthusiastic mallards & coots. There was also a strange welsh mountain lion claiming to be a duck, hovering up all the crumbs. Any one watching would think we never feed our poor corgi! It was like watching a surreal version of “the pied piper of Hamilton” starring my Dad. I am trying to fully focus on my future now but the poignancy of the distant roar of the heavy rush hour traffic signalling the “rat race” is in full flow, something that I could just not survive in a few years ago, was not lost one me. How lucky I was to be out of it, & instead sharing a walk with part of my beloved family. It is going to be a wrench to go back into the throng & leave this special place. A place filled with memories of the precious time I spent with my family & the wonderful community of dog walking friends. Afterwards, I then took my dear Mum off to her hairdressers mid morning. I am only too pleased to take her as there is no bus available & as much as I love him, the thought of my nearly 84 year old Dad driving them both there gives me nightmares. Mum has been seeing the same hairdresser for thirty years & nothing but nothing stops her from having it done. She so deserves her bit of pampering. While she is having her hair done I traipsed of round the supermarket doing part one of the family shop. Ordinary mundane stuff & yet it still brings a smile to my face. Food shopping just has to be got on with. Now clothes shopping that’s a different matter. As lady luck would have it Tesco’s did not have one of the food items Mum had asked for. On the way home we went off to Marks & Spencer’s. I have been looking for some new shoes for any future job interviews I am fortunate enough to get. For some reason the food shopping was completely forgotten as the lure of the shoe department beckoned. Mum found a sweet pair of pretty black shoes for her holiday. She loved them but they were a lot of money. I offered to buy them for her but sadly her head ruled her heart & she declined suggesting they pinched slightly. We looked at many many more together. We then went on to my favourite part of the shop, Per Una. http://www.marksandspencer.com/gp/node/n/43005030/202-3555186-1518228 I could not really afford their clothes but it did not matter. Window shopping is free. We picked out different skirts, tops, so many choices, gothic chic in sophisticated smokey blacks. Then we looked at a collection called Kasbah which I simply adored. They merged multi-ethnic influences with colour, textures & vibrant dyes. I was in heaven. These were the clothes that for me I had always dreamed of wearing but never believed I actually would. As far removed from drab, as it was possible to get. I had visualised wearing clothes like these to Art College as a teenager, many moons ago. We chatted away, laughed & joked about all the different styles. Totally relaxed as mother & daughter. I was unbelievably happy. We had bonded like never before. I asked my Mum did you ever imagine we could ever be like this together, so comfortable, so normal, & sooo incredibly happy. “No never” came her reply. We both had a tear in our eyes as we hugged. I estimated I could have spent around £500. Ironically when I had my career I could have done but I could not wear them then. It made no difference to me. We were totally engrossed in our own little world oblivious to the world around us, & viewed by all who were there, with total inconsequence as just another family out shopping, just as it should be. I had in recent years due to ill health suffered numerous panic attacks in this busy store but on this memorable day, we never gave one thought, that it may happen once more. Another ghost buried & closure achieved. On the way out we stopped off at the jewellery section to buy some imaginary jewellery for our imaginary outfits. All our clothes may have been imaginary but the feelings, the experiences were very very real. We were so incredibly lucky to have the chance to share something so special. We left the shop arm in arm with our cottage pie from the food department, with beaming smiles on our faces. We had found something that money simply cannot buy! The simple pleasures in life are free. We really are Mother & daughter. For the first time in our lives we were totally immersed in that feeling together. A very precious experience that I will treasure for the rest of my life. We are,………………. just sooooooo happy. We were so fortunate to be able to share this precious family time together. I wrote this on a day that changed so many lives for ever seven years ago. Excluding the 19 hijackers, 2,974 people died in the attacks. Another 24 are missing and presumed dead. Just how many other innocent people have lost there lives since is incalculable. My heart goes goes out to them all & the families they left. Pivotal moments in time like these will never be forgotten. So many hopes, so many dreams gone in seconds. So many lives ruined. Tragic days like 9/11 stick in your mind for ever. What if..., Why did...., if only....It is so easy to have regrets in life & dwell on your past. Life is so precious & is there to be lived, for we never know what lies around the corner. It is sometimes so easy to take life for granted. After reading my dear friend Jo's blog there is even more emotion attached to this day in history & appreciation of how lucky I am. I feel so very humble. I cannot help but think how many other brilliant girl & boy, genius's were tragically lost to the world that day? What a lovely moment. I do a lot of window shopping too, it's fun and it's free! You sound so happy - you've brightened my day too. It is so good to see you so happy Debbie.Does my heart good. Thank you dear Anji & Julia. I am both happy & humble. 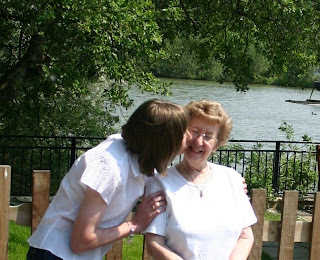 After reading dear Jo's blog I was moved to add my thoughts to the original posting of the special time I had with my dear Mum on the day before the anniversary of 9/11. I am so grateful that Jo survived the tragic events in her personal life the week of 9/11. The world could so easily have lost a brilliant girl genius that week. Without her inspiration, we may never have been friends & Debbie may not even be here now. Debbie what a sweet and moving story. It is so good when family can accept you for who you really are. Oh honey. I owe you so much too you know. I guess when you are friends with someone that's what it feels like. There are things you have been able to offer them, and things they have given you. You write so touchingly, movingly. It's like I'm shopping with your Mum. And as for per Una...couldn't agree more :-). I adore per Una. Was just in the M&S in Oxford Street the other day - you wouldn't believe the size of the per Una dept there. I can imagine those birds crowding round, once they see someone with some bread. It is indeed a simple pleasure (but great nonetheless)much like window shopping, its great to have someone like your Mum to shop with. I can't top your words on the attack seven years ago. Rightly the image of the attack is no longer shown without very good reasons. However it is a day I will never forget. Its right to remember the many innocents who died that bright day. You make me so proud to know you! This thoroughly touched my heart today Debbie! As always you have a sweet way of making the ordinary so exciting.